The only integrated player in the world manufacturing Transmission Line Towers, Fasteners, Overhead Transmission Line Fittings & Accessories and Structural Steel under one banner. Karamtara is an engineering, manufacturing and technology company. Incorporation in 1996, it began its journey in 1998, and since then Karamtara has evolved as a leader in the Transmission and Distribution (T&D) Segment of Power Sector. We are the only player to offer one stop solution for most items in T&D segment in the world of manufacturing Transmission Line and Telecom Towers, High Tensile and Mild Steel Fasteners, OHTL Hardware Fittings & Accessories, Hot Rolled HT & MS Structural Steel and Solar Structures. In a span of 17 years, from a single manufacturing unit, we now possess six manufacturing facilities in India and Italy. India Ratings (FITCH) has assigned the company the credit rating of IND A+ for long term borrowings and IND A1 for short term borrowings. Our products have been used in more than 40 countries e.g. India, Oman, Lebanon, Nigeria, Saudi Arabia, UAE, Tunisia, Ethiopia, etc. Our Transmission Line Towers Business has capabilities to design, manufacture and supply transmission lines up to 1200 kV. We have successfully supplied over 450000 MT of Transmission Line Towers in more than 25 countries. It has Fabrication and Galvanising capacity of 108000 MT per annum. The Fasteners business caters to Power Generation, Transmission & Distribution Industry, Telecom Tower Industry, Other Industries etc. with HT & MS Fasteners having manufacturing capacity of 24000 MT. Our Hardware Fittings & Accessories Business is spread in India and Italy and has the required expertise to design, manufacture, testing and supply these accessories up to 1200 kV. It manufactures Insulator String Fittings, Conductor Accessories, Vibration and Spacer Dampers, OPGW Fittings, Fittings and Accessories for Substations, Fittings for Power Distribution Lines, and Fittings & Accessories for Railways Electrification. We have supplied these accessories globally. 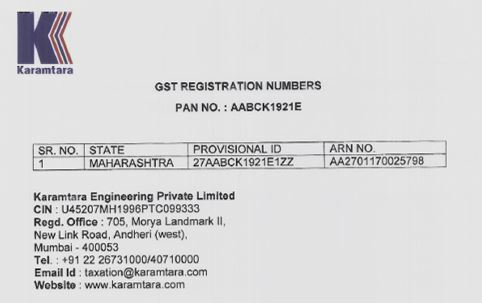 Karamtara has its business verticals spread across Transmission Line, Structural Steel, Fasteners, Hardware and Fittings business. The Company operates mostly from its plants based in Tarapur and Nagpur. All the plants are ISO 9001:2008, ISO 14001:2004 and OHSAS 18001:2007 certified.